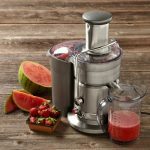 Do you want to purchase a high quality efficient juicer? 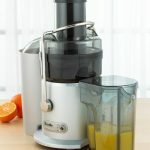 Do you have trouble choosing the right juicing machine? If yes, read on. With so many choices, it’s so easy to feel overwhelmed by the various types available. Each of these types is suited for specific needs and specific individuals. The right type is based on your needs and requirements. There’s no one type/brand that’s superior to the other. It’s solely based on your needs. The most popular Types Of Juicing Machines in the market is the Centrifugal Juicers. Centrifugal juicers are known for their ultra fast juicing and ability to effectively juice hard fruits and vegetables such as pineapple, apple, etc. 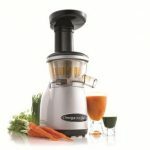 These juicers run on high speed motors with speeds ranging from 1500 RPM to 7000 RPM and more. 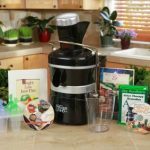 You can get fresh juice made ready for you in just a couple of minutes with centrifugal juicers. While centrifugal juicers are ideal for juicing hard fruits and vegetables without requiring any preparation (because they have extra wide chutes and the fruits and vegetables can be fed in whole without being cut), they are not effective for juicing softer fruits and leafy greens. 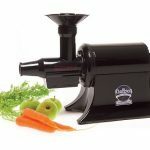 Unlike centrifugal juicers that run on high speed motors, masticating juicers run on relatively low speed motors. The motors of these machines only process at 80 – 300 RPMs (mostly 80). This ensures a higher juice yield on soft fruits, vegetables and leafy greens. They also do a pretty good job on harder fruits as well. But you’ll have to prepare these fruits and vegetables by cutting them into small pieces and then feeding them down the chute. The reason masticating juicers are preferred is because of their efficiency. They ensure the maximum amount of juice is extracted without causing oxidation. Centrifugal juicers have a tendency to oxidize the juice and kill off enzymes. This reduces the timeframe for which you can store the juice. Juice made through masticating juicers can be stored for a longer duration (up to 72 hours) because they maintain healthy enzymes. Triturating Juicers are the most efficient when it comes to juicing. Their operation is quite similar to that of a masticating juicer. The only difference is that masticating juicers run on a single gear whereas triturating juicers run on two gears. These are the best when it comes to juicing vegetables and leafy greens. They ensure the highest yield possible and eliminate all chances of oxidation. Like masticating juicers, the triturating twin gear juicers also require the ingredients to be prepared and fed in small pieces. They are not as fast as centrifugal juicers and take a considerable amount of time before giving you fresh juice. The juices made from the triturating models have the best taste. 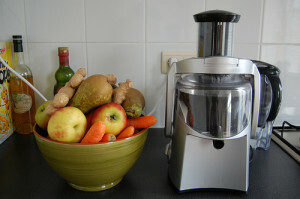 Have you had experiences with different Types Of Juicing Machines? Share your experiences with us in the comment section below.